Placed at 450 metres above sea level, Stroncone is placed in an enchanting position, and is therefore considered an eccellent climactic resort, where one can spend a tranquil and healthy summer stay. The first certain document mentioning Stroncone goes back to the year 1012. Nearly completely razed to the ground by troups from Narni after a long siege, the town was rebuilt in 1215 by the same ravagers on the orders of Pope Innocent III. 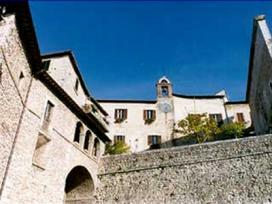 During the Middle Ages it was a strong-hold and was occupied in 1394 by Pandolfo Malatesta, but in 1405 the town rose up and beat back from its town walls Andrea Tomacelli who had taken it over. Finally free of every rule it took the part of the the Guelph party, and welcomed Pope Pius II, who left a very flattering description of the town and of the fertile country-side, with solemn honours into its walls. In 1527 the troups of the Bourbon conestabile, who were marching on Rome, besieged it, but the intervention of the men of Terni prevented the sacking. In 1799 also Stroncone rose up against the French, and sustained among other things the siege of battaglions under the command of General Jablonowschi. In 1929 the town temporarily lost its autonomy, to reacqist it in 1947. Among the most noteworthy monuments of the city the convent of St. Francis, founded by the Saint in 1213, should be mentioned. Immediately after the Town Portal, the entrance to the church of St. John, decorated by a worthy imitator of the artist Zuccari, is to be found. The Church of the Arcangel St. Michael, with its beautiful picture of the Rosary painted by Agresti follows. The Church of St. Nicholas preserves a beautiful Coronation of the Virgin by Rinaldo of Calvi, one of Spagna's foremost pupils. In the Town Residence a collection of precious documents of the 8th century onwards, various Roman stones, a noteworthy collection of coins and medals and nine parchment manuscripts containing valuables miniatures dating back to the 15th century, have been collected. The mountains tourist resorts of the Cimitelle and the Meadows, which are to be found at an altitude between 800 and 1100 meters above sea level, offer the possibility of enjoying a pleasant stay all the year round. Following charming paths, the peaks of the surrounding mountains, which dominate a vast panorama of the Terni basin and the Rieti plain may be reached.